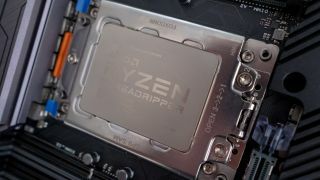 AMD has announced that a couple of new Threadripper 2nd Generation processors, one of which will be a 24-core beast, will go on sale October 29. These are the Ryzen Threadripper 2970WX and the 2920X, to be precise. The 2970WX is a top-end CPU with 24-cores (48-threads) and it has a base clock of 3GHz with boost to 4.2GHz, along with 64MB of cache and a TDP of 250W. So, in terms of the core specs, it’s the same as the flagship Threadripper 2990WX, except with 24 rather than 32-cores. Naturally, it’ll be cheaper too, with the recommended price pitched at $1,299 (around £995, AU$1,840) – as opposed to $1,799 (around £1,380, AU$2,550) for the 2990WX, so it’s nearly a third cheaper, in fact. As mentioned, this processor will be on shelves come October 29, along with the Threadripper 2920X, which is pitched at desktop enthusiasts, sporting 12-cores (24-threads), clocked at 3.5GHz (as previously rumored) with a boost to 4.3GHz, and with 32MB of cache and a TDP of 180W. This chip will retail at a considerably more affordable $649 (around £500, AU$920), and both processors are compatible with AMD’s motherboards running the X399 chipset, which the company is billing as the ‘ultimate desktop platform’ for PC enthusiasts. A 12-core CPU pitched at $649 (around £500, AU$920) is certainly a tempting prospect for those who want a beefy processor for their powerful rig without paying the world, relatively speaking. When you compare it to Intel’s Core i9-7920X 12-core offering, that’s priced at around $1,130 online at the time of writing (just under £1,000 in the UK, or about AU$1,600). Don’t forget that AMD is also unleashing Dynamic Local Mode at the end of the month, which the freshly released high-end Threadripper 2970WX (and existing 2990WX) will benefit from. This feature will shift the most demanding app threads to CPU cores with local memory access, and could provide a big performance boost for some applications and also games. Indeed, AMD has previously boasted of almost 50% gains in Battlefield 1 with ‘ultra’ detail settings using the 2990WX when Dynamic Local Mode is turned on. That’s a best case scenario, and it’s AMD’s own internal testing, but still, it very much sounds like this could be a major boon for those who enjoy their eye candy levels turned right up.